You may know there’s added sugar in your Coke or cookies. But did you know that it’s in your salad dressing, pasta sauce and bread? The Food and Drug Administration came out Friday with its new template for nutrition labels. One big change was the addition of a line for “added sugar,” to be placed below a line for total sugar. The change is designed to distinguish between sugars that are naturally occurring in a food — like the milk sugar in a plain yogurt — and the sugars that food manufacturers include later to boost flavors — like the “evaporated cane juice” in a Chobani Kids strawberry yogurt. A team of researchers at the University of North Carolina conducted a detailed survey of the packaged foods and drinks that are purchased in American grocery stores and found that 60 percent of them include some form of added sugar. When they looked at every individual processed food in the store, 68 percent had added sugar. Some of those products are more obvious sugary foods, but not all. 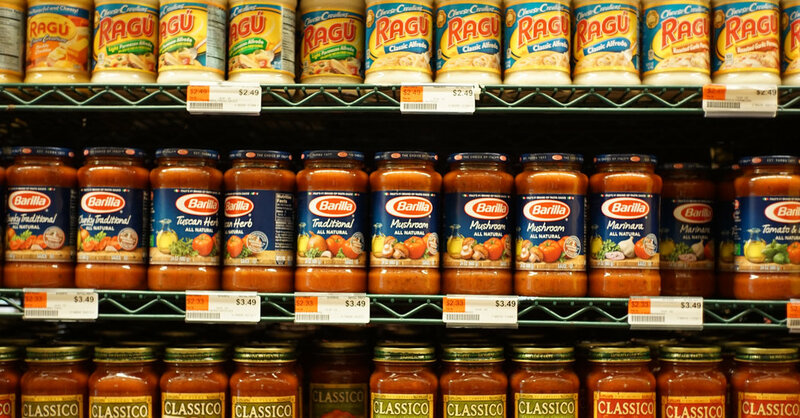 The list includes many sauces, soups, fruit juices and even meat products. You might think it’s easy to figure out whether the food manufacturer added sugar to your food, but it isn’t always so. While some foods include “sugar” in their ingredients, many use different words for products that are nutritionally similar. Most of us have heard of high-fructose corn syrup, a sugar made from processing corn. But there are also things like the “evaporated cane juice” in the yogurt, and “rice syrup” and “flo-malt,” which are less obvious and amount to the same thing. Barry Popkin, a professor of nutrition at the University of North Carolina, and one of the paper’s authors, said that the wide variety of sugars is not always meant to confound consumers. Instead, he said, the many sugar types are chosen by food scientists to give their products the best flavor and texture. Some sugars are better for baked goods, while others are better in soft drinks. Some are also cheaper than others. Sugar tariffs and import laws make it expensive to bring in too much foreign sugar. But not all of the sugar formulations count toward the laws’ quotas. There’s also the matter of fruit juice concentrates, which are juices that have been stripped of nearly everything but sugar and evaporated. A lot of seemingly natural foods include ingredients like “apple juice concentrate.” That’s sugar. That will be a lot clearer when the labels are updated. The emphasis on added sugar comes from new nutrition guidelines that urge Americans to consume a “healthy dietary pattern” containing certain types of foods. According to the regulation, hidden added sugars make it difficult to understand whether the food you are eating is part of that healthy pattern. Medical evidence shows that high sugar consumption is linked to obesity, diabetes and tooth decay — though not all of that work distinguishes between added sugar and total sugar. Many of the big food industry trade groups and lobbyists were satisfied with the new label rules, as my colleague Sabrina Tavernise recently wrote. But the sugar industry and the corn refiners are upset. Critics of the policy argue that the difference between natural and added sugars is not nutritionally meaningful, and that the science establishing health harms from added sugar is weak. The new label will kick in for large food companies in 2018, and for smaller companies a year later. The U.N.C. research used its master list of sugar code words to measure how many grocery store foods include sugar. But measuring the precise amount of sugars that are added with the current label is quite difficult. Mr. Popkin said consumers would be surprised by recent research from his team revealing the large amounts of added sugars in products that are generally thought of as healthy — foods like infant formula, protein bars and yogurt.